Healthcare professionals take pride in taking the best possible care of their patients. An important duty is to practice good hand hygiene in order to minimise cross-contamination and the spread of healthcare-associated infections. Research shows that hand hygiene dispensers have an impact on compliance rates1 . 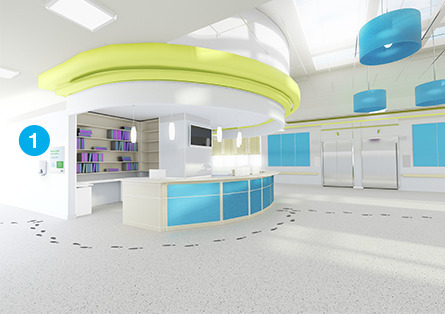 To help healthcare institutions maximise positive hygiene impact, Tork has created visual inspiration for supporting hospitals in dispenser placement decisions. What matters most isn’t putting up more dispensers, but making sure they are correctly placed. In fact, studies show that optimising dispenser placement2 can increase usage by more than 50%, and that simply increasing the number of dispensers has a smaller impact on usage than keeping the same number of dispensers but making them more prominently visible. Every hospital is unique; to truly optimise dispenser placement a work-flow study is needed. However, the inspirational guide can help with some general principles. The information in the placement guide is based on both Essity-sponsored research and independent findings from academic research. 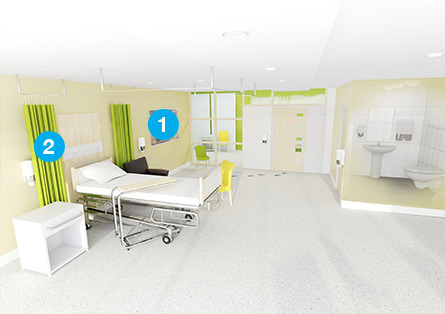 The guide is built around visualisations of four common types of areas commonly found in hospitals. The visualisations suggest possible dispenser placements which support hand hygiene compliance with the important WHO 5 Moments in mind. Many visitors do not clean their hands when entering the hospital. Giving easy access to and info about hand hygiene could potentially have great benefit. Source: Euro Surveill. 2009 Sep 17;14(37). pii: 19331. Sub-optimal hand sanitiser usage in a hospital entrance during an influenza pandemic, New Zealand, August 2009. Murray R1, Chandler C, Clarkson Y, Wilson N, Baker M, Cunningham R; Wellington Respiratory and Hand Hygiene Study Group. This type of room requires more than one dispenser. Familiar locations eliminate the need to look for dispensers. In one observational study dispensers located near the sink and at the entrance to the room were used more frequently than dispensers at the rear of the room. 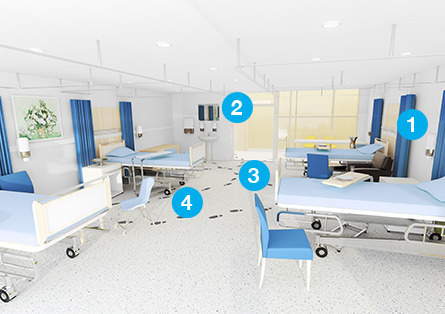 Perform a work-flow study to see where the “high-traffic” areas of the room are as well as where healthcare workers are standing when one of the 5 moments occurs. In addition to high traffic, take extra care to see where healthcare workers move between patients. 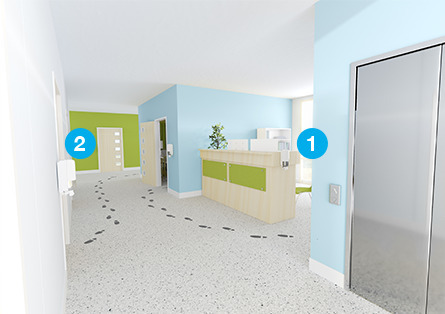 Placing dispensers on “walking-routes” or at a site where care is frequently provided results in more usage. Dispensers should not be out of the way, behind another object or out-of-sight. Note: Placing dispensers in bedbrackets is good in addition to other ABHR but might result in bottles disappearing when bed is taken out of the room. An observational study showed that dispensers located at the nursing station were used more frequently than dispensers placed on the wall behind patient beds. Place dispensers in walking corridors for use on the go. Source: Essity Internal study, Netherlands 2015. For information and downloads of educational material from WHO please click here. 1Boog, Matthijs C., Vicki Erasmus, Jitske M De Graaf, Elise (A) He Van Beeck, Marijke Melles, and Ed F Van Beeck. Assessing the Optimal Location for Alcohol-based Hand Rub Dispensers in a Patient Room in an Intensive Care Unit. BMC Infect Dis BMC Infectious Diseases 13.1 (2013): 510. 2Thomas BW, Berg-Copas GM, Vasquez DG, Jackson BL, Wetta-Hall R. Conspicuous vs Customary Location of Hand Hygiene Agent Dispensers on Alcohol-Based Hand Hygiene Product Usage in an Intensive Care Unit. J Am Osteopath Assoc 2009;109(5):263-267.